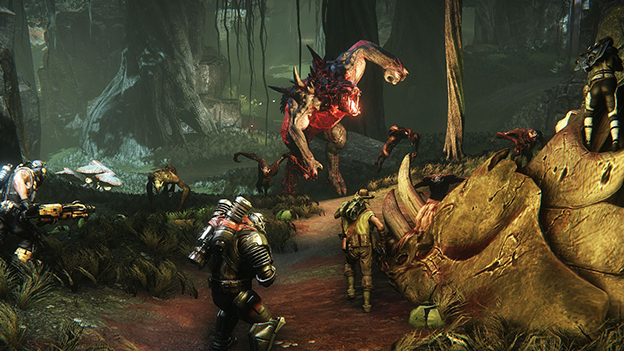 One of the best, if not THE best shooter to come out of E3 2014 was Evolve, a brand new 2K games project from the brilliant minds that brought you Left 4 Dead. 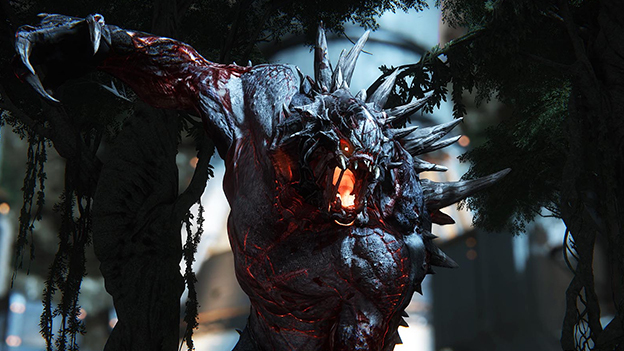 Another wonder of asymmetrical gameplay, Evolve puts hunters against one monster in a battle for supremacy. The thing is, each hunter and the monster itself is controlled by a human opponent. It’s a multiplayer only game, and it’s awesome, and I foresee myself playing this for many hours once it hits store shelves. So let’s talk about the two halves of this game. The monster’s goal is simple. They either have to kill all four of the hunters, or have to destroy the hunters’ generator. Note, that hunters can respawn once killed, though they can’t do so infinitely, and if you ever manage to kill all four at once, you just win flat out. All monsters start out pretty weak to begin with. They only have a few abilities with slow recharges and most of these abilities are related to mobility or stealth. However, the monsters have an advantage over the hunters. They can eat, and as they eat they evolve. There are random other A.I. controlled creatures scattered all around the map, that will hunt both the monster and hunters alike. The hunters get nothing for killing these creatures other than safety. The creature, on the other hand, can devour these creatures, though doing so takes time and leaves him out in the open. Eating creatures gives the monster temporary health and fills up his evolution meter. The temporary health is important, because the monster has no way to restore his permanent HP. So any damage taken at the beginning of the game will stick around at the end of the game. The hunters, on the other hand, simply regenerate their life the way any shooter characters do. When your evolution meter is full, you need to find a safe place to hide because it’s time to evolve. Evolving does a lot of things; it increases your damage, decreases damage you take, and gives you tons of new abilities with faster cool-down. Usually, abilities from evolution level 2 and onward are attack and damage dealing abilities that make it very hard for the hunters to fight you. By the time you hit evolution level three, you very clearly have the advantage over the hunters and can either go on a rampage, attempting to take them all out, or make a beeline for their generator. The hunters, of course, have the goal of finding the monster as soon as possible, and they have a lot of tools that help them out in their search. Every hunter has a jetpack, which allows them to practically ignore the vertical elements of the stage. Even if their fuel runs out it just regenerates over time, and if they were pressing against a wall when it did run out, they get to climb up it anyway. The hunters also have a lot of interesting abilities that let them track the monster as well. The trapper, for example, has a hunting dog that will always run directly toward where the monster is in a straight line. Of course, as long as the monster keeps moving this can easily confuse the hound, as the hound cannot traverse terrain vertically without its owner doing so first. The support class has the ability to launch a remote UAV that can fly through the level and search for the monster. If it spots the monster for a long enough time, the monster’s location will be tagged on each hunter’s map. The terrain is also working against the monster. Hunters will always be able to see the monsters last few footsteps, following its trail to its current location. So the monster will have to jump a lot, dive into water, and do other things to make its trail hard to follow. 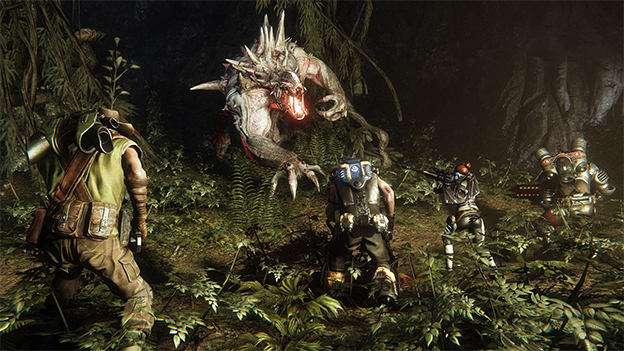 In addition, the hunters are alerted whenever the monster scares another creature smaller than it. That creature will cry out and the location of the cry will be posted on the map for everyone to see. Hunters need to work together to take down the monster. No one hunter can take down the monster alone at any level. However, in tandem the hunters are a powerful force. The trapper can set down “mobile arenas” that restrict the monsters movement and prevent it from getting away. The support class can lay out turrets that auto fire on the monster whenever he walks past. Medics can keep heavy units, like the assault class, alive. There are plenty of other classes to choose from, and when all hunters work together the monster rarely stands a chance. 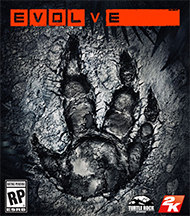 And that’s the main theme of Evolve. It’s teamwork versus cunning. It’s numbers versus strength. It’s the masses versus the dictator. In a word, it’s awesome, and I can’t wait to play some more. Many different monsters to choose from each with their own abilities. Incredible hunter design with abilities that synergize with each other. Very vertical maps with tons of places to explore.